VICTIMS WERE ‘NOT well served’ by gardaí in the Cavan-Monaghan division between 2007 and 2008, the O’Higgins Commission has concluded. The commission’s report which the Minister of Justice Frances Fitzgerald received on 25 April was released just after noon today following much criticism about the delay. Despite not finding any evidence of garda corruption in the area, Judge Kevin O’Higgins highlights serious flaws and failures in a number of investigations over the time period. It also found a lack of adequate communication with the victims of crime was a common feature in all the cases examined. It blames those mistakes and errors on human behaviour and points the finger at “poor individual performance” and “poor supervision”. The 300-page document outlines various problems with garda management, resources and procedures. Speaking to TheJournal.ie following the publications of the report, the GRA representative for Cavan-Monaghan James Morrisroe said that the Bailieboro district has been operating under a cloud of suspicion for nine years. In the context of any such grave allegations the former commissioner is entitled to have his reputation vindicated. In the matters under consideration any aspersions cast on the integrity of the former commissioner were unfounded and were deeply hurtful. 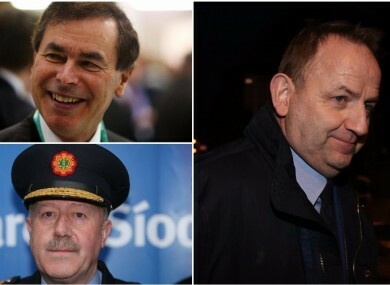 Allegations made by garda whistleblower Sergeant Maurice McCabe brought about the investigation, some of which have been upheld. The judge also notes that McCabe took those actions out of legitimate and genuine concerns. He describes the sergeant as a dedicated and commited member of the force who showed courage and has performed a “genuine public service at considerable cost”. The failures investigated by the commission were at a human level and caused by poor individual performance and, in many instances, by poor supervision. Issues of management and resources showed that there were problems at many levels of the force. There was very limited involvement by unit sergeants in incidents examined in the Bailieboro district. In nearly all cases examined by the commission there was a lack of proper recording and note taking. There were “considerable delays” in having material examined by the Computer Crime Unit in Dublin due to shortage of staff. Sergeant McCabe was never less than truthful in his evidence but may have been prone to exaggeration at times. Sergeant McCabe acted out of genuine and legitimate concerns, and the commission unreservedly accepted his bona fides. Sergeant McCabe showed courage and performed a genuine public service at considerable personal cost. There was “not a scintilla of evidence” to support an allegation of corruption made against ex-garda commissioner Martin Callinan. The garda station in Bailieboro is not fit for purpose. The conditions were deplorable and were not conducive to either good policing or good morale. There was much good work performed “unhonored and unsung” by the gardaí in Bailieboro district. Victim impact statements should be used in court more often. The commission was surprised to hear that a period of service for superintendents of eighteen months to two years was normal, not only in Bailieboro, but throughout the country. The commission said that any disciplinary proceedings, which might conceivably arise out of its findings, would not be helpful to An Garda Síochána. Speaking after the publication of the report, Tánaiste and Minister for Justice Frances Fitzgerald said she fully accepts that Sergeant McCabe acted out of genuine concern and that a “sea change is needed” within the gardaí and the wider criminal justice system. She also noted that former minister Alan Shatter “acted appropriately with these issues” and that there were “no question of corruption” in relation to Callinan. She will now send the report to the newly-formed Policing Authority. This afternoon, former Justice Minister Alan Shatter released a lengthy statement, in which he called for the Taoiseach Enda Kenny to “correct the Dáil record”, after accepting what Shatter called “the flawed conclusions and opinions” contained in the Guerin Report. Email “O'Higgins Report: Victims let down by serious flaws and failures in garda investigations”. Feedback on “O'Higgins Report: Victims let down by serious flaws and failures in garda investigations”.